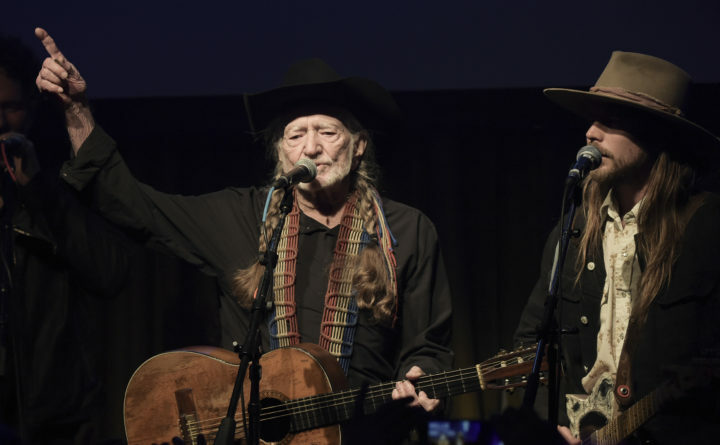 Willie Nelson, left, and Lukas Nelson perform at the Producers & Engineers Wing 12th Annual GRAMMY Week Celebration at the Village Studio on in Los Angeles, Feb. 6, 2019. American icon Willie Nelson will bring his Outlaw Music Festival to the Bangor waterfront this June, when the traveling music and culture fest hits the Darling’s Waterfront Pavilion. The Outlaw Music Festival, set for Friday, June 14, will feature Willie Nelson and Family headlining a bill that also features Phil Lesh, bass player from the Grateful Dead; bluegrass legend Alison Krauss; songwriter Lukas Nelson, son of Willie, and his band the Promise of the Real; and the Revivalists and Particle Kid. Tickets go on sale via Ticketmaster on Friday and start at $30. Willie Nelson, 85, last played in Bangor in 2014, but is no stranger to the Queen City; he played at the old Bangor Auditorium a number of times over the years. On his last visit, in 2014, he also performed with Krauss. Krauss is a bluegrass virtuoso who has sold over 12 million albums and won 27 Grammys, the most for any woman. Lesh, one of the original members of the Grateful Dead, will also join the Outlaw tour, playing as Phil Lesh and Friends. The Phil Lesh and Friends lineup features Lesh and a revolving array of musicians, interpreting the music of the Grateful Dead in a harder-edged, more Southern rock-inspired way. Lukas Nelson is a skilled songwriter in his own right. He and his band The Promise of the Real have been Neil Young’s backing band since 2015. The band also performed as the backing band for the band of Bradley Cooper’s character in the 2018 megahit “A Star Is Born,” which Nelson co-wrote and for which he produced several of the songs. Rounding out the bill is the New Orleans-based roots rock band The Revivalists, best known for its hit 2017 song “Wish I Knew You,” and Particle Kid, aka J. Micah Nelson, another of Willie Nelson’s sons, who plays electronic-tinged psychedelic folk music. There are 11 other other artists and festivals set for the Darling’s Waterfront Pavilion this summer, including two nights of Phish on June 25 and 26, Heart and Sheryl Crow on July 23, a sold-out concert from country star Chris Stapleton on July 25, and Train and the Goo Goo Dolls on July 30. More announcements will be coming in the next few weeks.